Download Catalog #72 PDF: Click to download (requires Adobe Acrobat Reader). Printable in B&W or color! 1932 Fords Patent “Large” plunger-fill in Smooth Sterling Silver over Black Hard Rubber. Extremely rare without the overlay – rare as hen’s teeth with the overlay! A highly unusual pen with a unique filling mechanism! The barrel unscrews and removes to access the ink reservoir (which came both amber and clear) with it’s cork gasket. The pen fills on the pull stroke and a sliding seal moves out of the way on the push stroke so the ink doesn’t expel. Shown both closed and open. More information here: http://www.penpractice.com/page10.html. Medium nib, with a tad of flex. 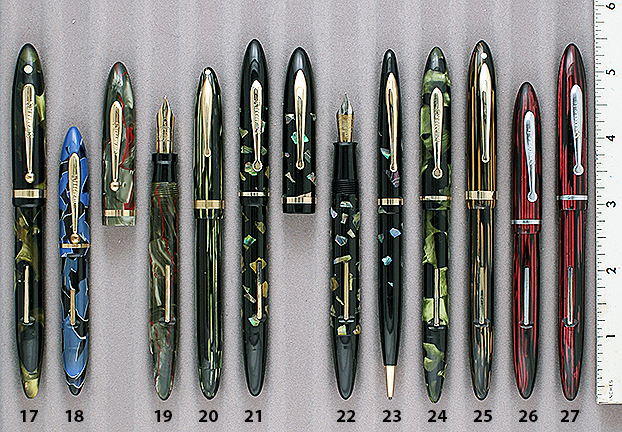 In Lambrou’s 1989 book, he mentions that these pens were produced under license for T.B. 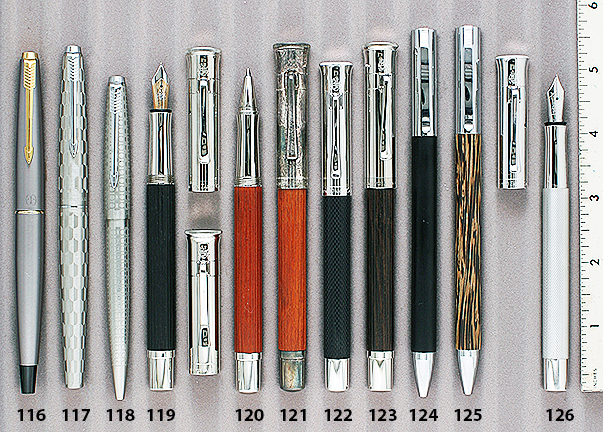 Ford, Ltd. by the Wyverne Pen Company, a major UK pen manufacturer. Near mint. 1938 Montblanc K122 BF in Azurite Blue (Lapis). GFT. One of the rarest models, and in one of the rarest colors. Never offered by Montblanc with a clip. Fine, flexible nib. Near mint. 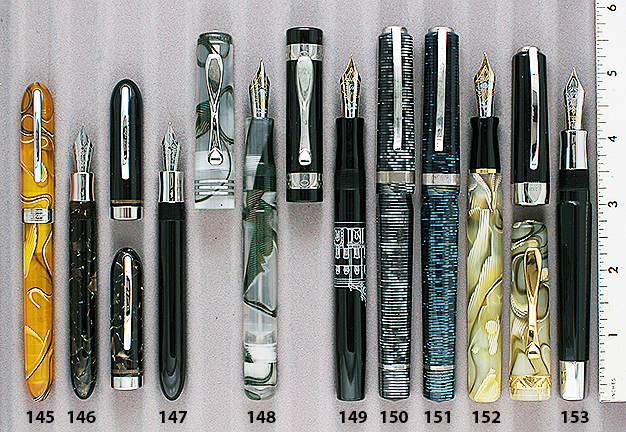 1910 Parker 15 eyedropper-fill in Corrugated Abalone barrel and Gold-filled Filigree cap. Fine, extra-flexible nib. An outstanding pen in wonderful condition. Near mint. 1929 Parker Duofold Sr. Streamline in Lapis (perfect color!!). GFT. Medium nib, with just a touch of flex. Near mint. 1929 Parker Duofold twist-activated pencil for above set. 1908 Waterman 514 eyedropper-fill in 9K Solid Gold “Heavy Fluted” pattern with green Cabochon mounted in the cap top. Extraordinarily rare. Has all the proper hallmarks. Extra-fine, flexible nib. Near mint. 1920 Waterman 456 lever-fill in Sterling Silver “Basket-Weave” pattern over black hard rubber. Quite rare, in this large size. Fine, flexible nib. A little wear to the bottom imprint (fully readable), otherwise near mint. Will polish on request. 1955 Waterman 149 PIF in Celluloid. Early, pre-injection molded ‘Precious Resin’ production when Montblancs were still hand made by master machinists. Outer two cap bands are sterling silver, otherwise GFT. Visualated barrel window with vertical lines (a tad of wear, otherwise near mint). Three-tone 14C nib. Two available: (1) Double-broad, oblique nib (shaped like left foot. ); (2) Broad/double-broad, italic nib. 1933 Astoria 01 Safety eyedropper-fill ring-top in smooth gold-filled. Black ends with bulbous derby with 4-quadrant black & white logo. Medium, extra-flexible nib. A few pinpoint dings on the upper part of the cap (noticeable with a loop), otherwise near mint. Restored. Will polish on request. 1945 Omas Colorado double-barreled, double nibbed PIF in Black with “scissor” barrel configuration. NPT. Red dot & white dot on gripping sections so you know which side has which color ink. Incredible pen, almost never found in this condition. Shown open. The scissor “swivel” allows the user to fill each of the two reservoirs separately. Medium/fine nibs. Near mint. Shown open. 1955 Pelikan 520N PIF in Rolled-gold (gold-filled). Alternating wave-chased, plain and pinstriped panels. Not only is the “N” model rare (only made one year), but the fully covered 520 makes it 10 times rarer! Visualated barrel with vertical stripes. Medium/fine nib, with a tad of flex. Near mint. 1937 Pelikan 101 PIF in Coral Red. One of the rarest colors and certainly one of the “holy grails” for serious Pelikan collectors!. Amber celluloid barrel. GFT. Fine, flexible nib. Just a touch of wear to the cap logo (still fully legible), otherwise near mint+ in original box (box a little worn). Close-up of pen in box. 1942 Pelikan IBIS PIF in Grey Marble. So rare, most folks don’t even realize that the IBIS was made in any color except Black! GFT. Visualated barrel. Signed “IBIS” fine nib. Near mint. 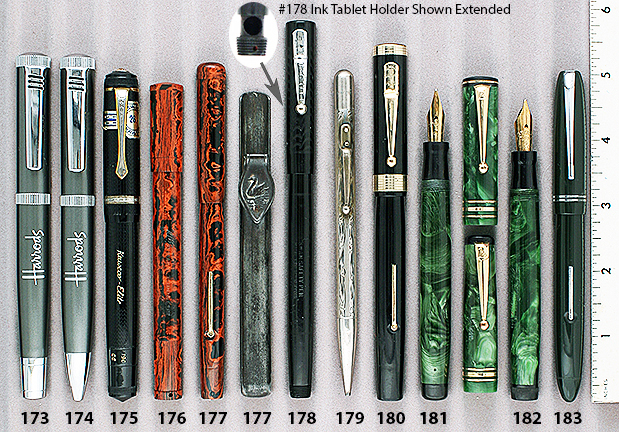 A must for any serious Pelikan collector. 1930 Sheaffer Lifetime Balance LF (full length; thin) in Green Marble. GFT. Visualated section. Two-toned, fine nib. A tad of trim brassing, otherwise near mint. 1933 Sheaffer 3-25 Balance LF in Blue, Black & White. A beautiful celluloid unique to Sheaffer. GFT. Extra-fine nib. The barrel is half-a-shade darker than the cap (otherwise would be $375). Near mint. 1933 Sheaffer Lifetime Balance LF in Red Veined Grey. GFT. Fine nib. Near mint. 1937 Sheaffer 350 Lifetime LF Balance in Green Striped. GFT. Two-toned, medium nib. Near mint. 1936 Sheaffer 3 LF Balance in Ebonized Pearl. GFT. Visualated section. Extra-fine/fine nib. Near mint. 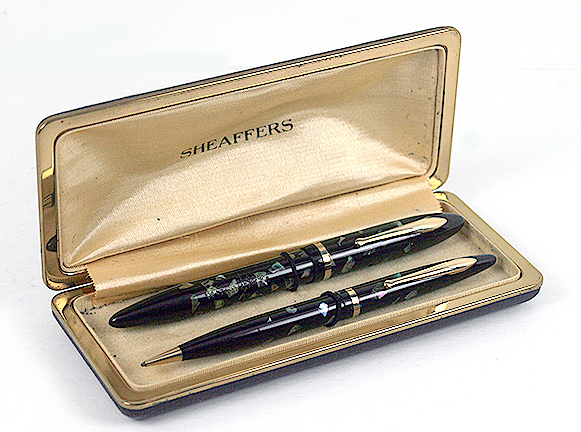 1936 Sheaffer #5 Feather-Touch LF Balance Set in Ebonized Pearl. GFT. Two-toned, fine nib. New-old-stock. Mint in original box. Close-up of set in box. 1936 Sheaffer twist-activated pencil for above set. 1937 Sheaffer 350 Lifetime LF Balance in Golden Striped. GFT. Visualated section. Two-toned fine nib. Near mint. 1936 Sheaffer 275 “Junior” Balance LF in Red Striped. NPT. Clip and nib signed “Sheaffer Junior.” Visualated section. Fine nib. Near mint. 1936 Sheaffer 275 “Junior” Balance LF in Red Striped. NPT. Clip and nib signed “Sheaffer Junior.” Medium nib. 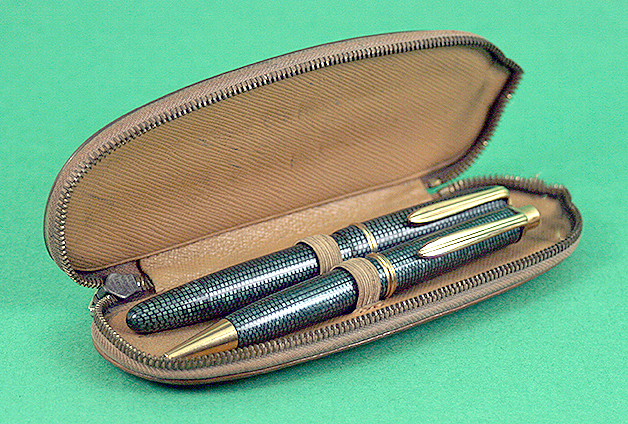 1937 Sheaffer 500 Feather Touch LF Balance in Green Striped. GFT. Visualated section. Two-toned, fine nib. Near mint. 1937 Sheaffer 275 LF Balance in Green Striped. NPT (very unusual on a green striped Sheaffer). Fine nib. Some plating wear to the clip, otherwise near mint. 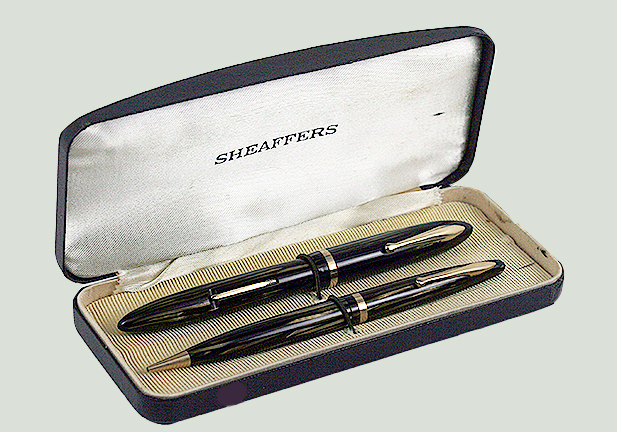 1937 Sheaffer Lifetime Balance Large LF Set in Black. GFT. Visualated section. Two-toned, medium nib. Near mint. 1937 Sheaffer Lifetime Balance Large twist-activated pencil for above set. 1937 Sheaffer Lifetime Balance Large Vacuum-fill in Ebonized Pearl. Rare! GFT. Visualated barrel with spiral lines. Two-toned, fine nib. A small touch of clip ball brassing, otherwise near mint..
1937 Sheaffer Lifetime Balance Large LF in Carmine (Red Striped). Rare! GFT. Visualated section. Two-toned medium/fine nib. Near mint+. 1937 Sheaffer 500 Feather Touch LF Balance Set in Brown Striped. GFT. Visualated section. Two-toned, fine nib. New-old-stock. Mint in original box. Close-up of set in box. 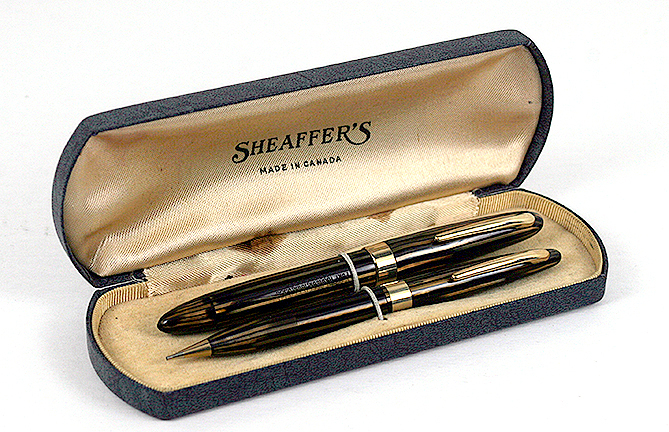 1937 Sheaffer 500 Feather Touch LF Balance Set in Brown Striped. GFT. Visualated section. Two-toned, medium nib. Near mint. 1937 Sheaffer Lifetime Balance Vacuum-fill in Golden Striped. GFT. Visualated barrel. Two-toned, extra-fine nib. Near mint+ (could be new-old-stock). 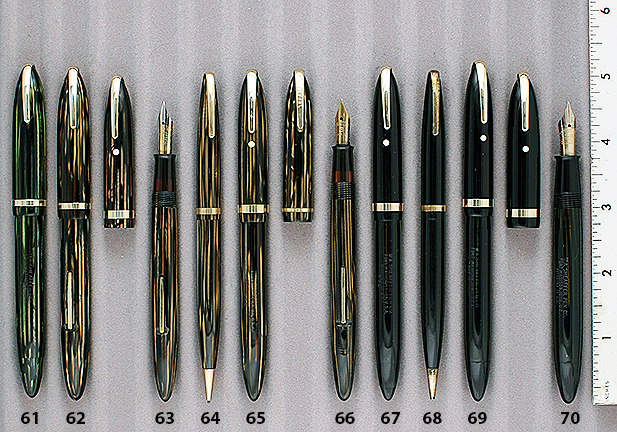 1937 Sheaffer 1275 Lifetime Crest LF Balance in Black with GF cap (alternating pinstripes and plain panels). Rare, first year model with the cap threads at the very front of the barrel. Visualated section. Two-tone, extra-fine nib. New-old-stock. Mint. (If you ask for it, I have a slightly beat up matching pencil I’ll add at no cost). 1937 Sheaffer 1375 Lifetime Crest LF Set in Golden Striped. GF caps and trim (alternating pinstripes and plain panels). Rare, first year model, with the cap threads at the very front of the barrel. Pen barrel engraved: “LBG.” Extra-fine nib. Near mint. 1937 Sheaffer 1375 Lifetime Crest twist-activated pencil for above set. 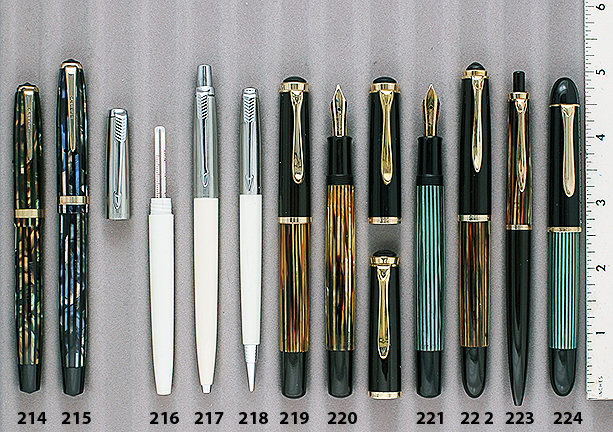 1937 Sheaffer 1375 Lifetime Crest LF Balance in Golden Striped with GF cap (alternating pinstripes and plain panels). Rare, first year model with the cap threads at the very front of the barrel. Visualated section. Two-tone, medium nib. Near mint+. 1937 Sheaffer Lifetime Balance Large LF in Green Striped. GFT Visualated section. Two-tone, medium nib. Near mint. 1937 Sheaffer Lifetime Balance 1000 Large Vacuum-fill in Green Striped. GFT Two-tone, medium/fine nib. Barrel engraved: “J.P.” Near mint. 1937 Sheaffer Lifetime Balance Large LF Set in Golden Striped. GFT Visualated section. Two-tone, medium nib. Near mint. 1937 Sheaffer 500 Feather Touch Balance Vacuum-fill in Grey Striped. NPT. Two-toned, medium nib. A little plating wear, otherwise near mint. 1937 Sheaffer 5 Feather Touch Vacuum-fill Balance in Grey Striped. NPT. Visualated barrel. Rare “Jeweler’s Band” model, with wide, vertically pinstriped cap band. 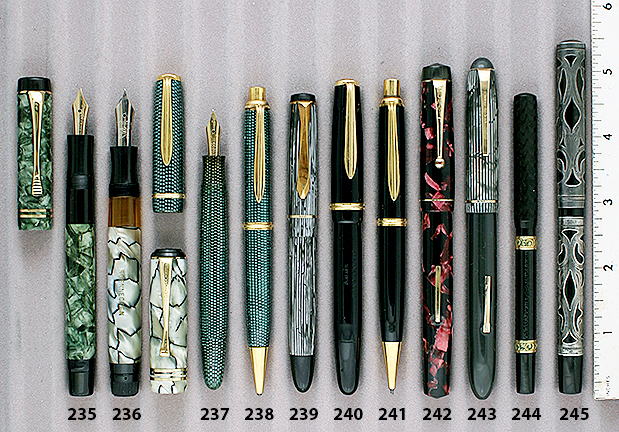 These were provided to jewelry stores so their pen line did not compete with the normal pen shops. Two-toned, fine nib. Near mint. 1939 Sheaffer 875 Lifetime Balance LF in Red Striped. GFT. Visualated section. Two-toned fine nib. Near mint. 1940 Sheaffer Tuckaway Lifetime Vacuum-fill Balance in Gold-filled cap and barrel. Alternating pinstripes and plain panels. Two-toned, medium/fine nib. Indicia engraved “S.A.E.” Near mint. 1944 Sheaffer Tuckaway White Dot Vacuum-fill Set in Black. Huge! Medium/fine nib with just a tad of flex. New-old-stock. Mint in original box (very threadbare). 1944 Sheaffer Tuchaway twist-activated pencil in Black for above set. 1945 Sheaffer 875 Vacuum-fill Balance in Golden Striped. GFT. Visualated section. Two-tone, medium nib. Near mint+. 1945 Sheaffer 875 Vacuum-fill Balance Set in Golden Striped. GFT. Visualated section. Two-tone, medium nib. New-old-stock. Mint in original box. Box from Canada; pen set from the USA. Close-up of set in box. 1945 Sheaffer 875 twist-activated pencil in Golden Striped for above set. 1949 Sheaffer 875 Lifetime Balance Vacuum-fill Set in Black. Visualated section. Two-toned fine nib. New-old-stock. Mint. 1949 Sheaffer 875 Lifetime twist-activated pencil in Black for above set. Met specifications for use in military shirt and jacket pockets. 1941 Sheaffer 500 Defender LFl Balance in Golden Striped. GFT. Visualated section. Two-toned, extra-fine nib. Near mint+ (could be new-old-stock). 1941 Sheaffer 875 Lifetime Vigilant twist-activated pencil in Golden Striped for above set. 1941 Sheaffer Lifetime Vigilant twist-activated pencil in Black for above set. 1941 Sheaffer 1000 Lifetime Balance Vacuum-fill in Black. GFT. Visualated barrel. Two-toned, fine nib. Near mint. Sheaffer’s extremely innovative “Wrap-around” nib, introduced in 1942, every pen bearing the “Lifetime” designation and guarantee. Offered as a Lever-fill or Vacuum-fill, the latter having a much greater ink capacity. The filler mechanism on the Vacuum-fill pens we sell comes with a two-year warrantee. 1937 Sheaffer 2000 Lifetime Triumph Autograph LF Balance in Black. “2000″ on barrel. Two-toned, medium/fine nib. Visualated section. 14K cap band and clip. Near mint. See matching pencil below. 1937 Sheaffer Lifetime Autograph Balance twist-activated pencil. No engraving Matches any of the three pens above. 1942 Sheaffer 2000 Tuchaway Lifetime Triumph Autograph Vacuum-fill Set in Black. “2000″ on barrel. Two-toned, broad nib. Visualated section. 14K cap band and clip. Near mint. 1942 Sheaffer 2000 Tuckaway twist-activated pencil in Black for above set. 1944 Sheaffer 1000 Triumph Lifetime Balance Vacuum-fill Set in Red Striped. GFT. Visualated barrel. Two-tone, medium nib. Near mint. 1944 Sheaffer 1000 twist-activated pencil in Red Striped for above set. 1944 Sheaffer 1000 Triumph Lifetime Balance Vacuum-fill in Golden Striped. GFT. Visualated barrel. Two-tone nib. Near mint. Two available; (1) fine; (1) Extra-smooth medium (tad of band brassing). 1945 Sheaffer 1250 Tuckaway Lifetime Triumph Balance Vacuum-fill in Green Striped. GFT. Visualated section. Two-tone medium/fine nib. Near mint. 1946 Sheaffer 1250 Lifetime Triumph Balance Vacuum-fill in Golden Laminated. GFT. Visualated Section. Two-toned, medium/fine nib. Near mint. 1946 Sheaffer 1250 Lifetime Triumph Balance Vacuum-fill Set in Black. GFT. Visualated Section. Two-toned, medium/fine nib. Near mint. 1946 Sheaffer 1250 twist-activated pencil in Black for above set. 1946 Sheaffer 1250 Lifetime Triumph Balance Vacuum-fill in Black. GFT. Visualated Section. Two-toned, medium/fine nib. Near mint. 1946 Sheaffer 1250 Lifetime Triumph Balance Vacuum-fill in Green Striped. GFT. Visualated Barrel. Two-toned, broad nib. Near mint. 1946 Sheaffer 1250 Lifetime Triumph Balance Vacuum-fill Set in Golden Striped. GFT. Visualated Barrel. Two-toned, fine nib. Near mint. 1946 Sheaffer 1250 twist-activated pencil for above set. 1946 Sheaffer 1250 Lifetime Triumph Balance Vacuum-fill in Golden Striped. GFT. Visualated Barrel. Two-toned, fine nib. Near mint. 1946 Sheaffer 1250 Lifetime Triumph Balance Vacuum-fill Set in Red Striped. GFT. Visualated Barrel. Two-toned, medium/fine nib. Near mint. 1950 Sheaffer Sentinel Deluxe Triumph White Dot Vacuum-fill in Grey Striped with Pinstriped Polished Chrome cap. GF cap band and clip. Visualated Section. Two-toned medium/fine nib. Near mint. 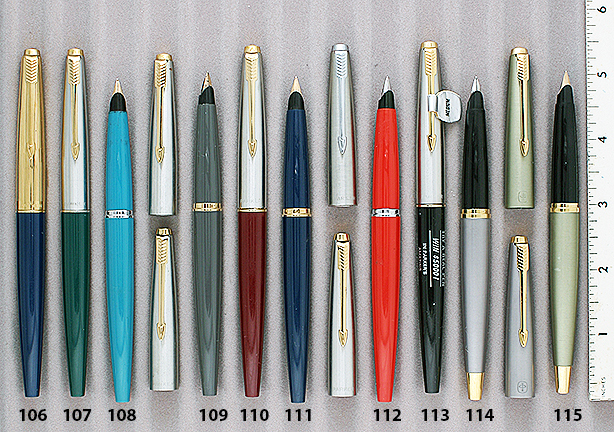 At first, an economy priced pen, made in an array of colors and finishes to appeal to the younger generation, and have become very collectible due to the array and moderate prices. 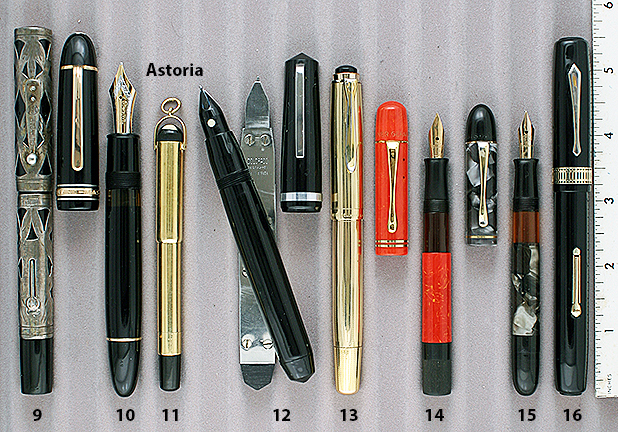 The “screw-in” nib unit was innovative to Parker and easy to change (think Esterbrook!). 1960 Parker 45 Classic cartridge/converter-fill in Grey with Brushed Lustraloy (Stainless Steel) cap and Gold-filled clip. Medium, alloy nib. New-old-stock. Mint. Converter included. 1962 Parker 45 CT Arrow cartridge/converter-fill in Black. CPT. In 1962 Parker introduced injection molding and started producing a 45 with a matching plastic cap. 14K medium nib. New-old-stock. Mint. Converter included. 1962 Parker 45 CT Arrow cartridge/converter-fill in Dark Blue. CPT. In 1962 Parker introduced injection molding and started producing a 45 with a matching plastic cap. 14K medium nib. New-old-stock. Mint. Converter included. 1962 Parker 45 CT Arrow cartridge/converter-fill in Burgundy. CPT. In 1962 Parker introduced injection molding and started producing a 45 with a matching plastic cap. 14K medium nib. New-old-stock. Mint. Converter included. 1964 Parker 45 Flighter cartridge/converter-fill in stainless steel. A top-of-the-line 45. GFT. 14K medium nib. New-old-stock. Mint. Converter included. Buy with matching pencil, #105 below, at $100. 1964 Parker 45 Flighter cartridge/converter-fill in stainless steel with GF trim. Note that it differs from the all metal Flighter above, having the black barrel end showing. A top-of-the-line 45. GFT. 14K medium nib. New-old-stock. Mint. Converter included. [Two available]. Buy with matching pencil, #105 below, at $110. 1964 Parker 45 Insignia cartridge/converter-fill in gold-filled with matching cap. Alternating pinstriped and plain panels. 14K medium nib. New-old-stock. Mint. Converter included. 1964 Parker 45 Flighter cartridge/converter-fill in stainless steel with CP trim. Note that it differs from the all metal Flighter above, having the black barrel end showing. A top-of-the-line 45. GFT. 14K medium nib. New-old-stock. Mint. Converter included. [Two available]. Buy with matching pencil, #105 below, at $100. 1964 Parker 45 Flighter Twist-activated Pencil in stainless steel. New-old-stock. Mint. Matches pen #102, #102, #104 above. 1965 Parker 45 Custom cartridge/converter-fill in Dark Blue with gold-filled cap (alternating pinstriped and plain panels) Rare model! 14K medium nib. New-old-stock. Mint. Converter included. 1967 Parker 45 cartridge/converter-fill in Dark Green with Brushed Lustraloy (Stainless Steel) cap and GF trim. Medium, 14K nib. New-old-stock. Mint. Converter included. 1967 Parker 45 cartridge/converter-fill in Light Blue with Brushed Lustraloy (Stainless Steel) cap and Gold-filled trim. Medium, 14K nib. New-old-stock. Mint. Converter included. 1967 Parker 45 cartridge/converter-fill in Dark Grey with Brushed Lustraloy (Stainless Steel) cap and Gold-filled trim. Medium, 14K nib. New-old-stock. Mint. Converter included. 1967 Parker 45 cartridge/converter-fill in Burgundy with Brushed Lustraloy (Stainless Steel) cap and Gold-filled trim. Medium, 14K nib. New-old-stock. Mint. Converter included. 1967 Parker 45 cartridge/converter-fill in Dark Blue with Brushed Lustraloy (Stainless Steel) cap and Gold-filled trim. Medium, 14K nib. New-old-stock. Mint. Converter included. 1967 Parker 45 cartridge/converter-fill in Matador Red (rare) with Brushed Lustraloy (Stainless Steel) cap and CP trim. Medium, alloy nib. New-old-stock. Mint. Converter included. 1967 Parker 45 Classic Promotional cartridge/converter-fill in Black with Brushed Lustraloy (Stainless Steel) cap and gold-filled trim. Barrel imprint reads: “Try a real pen – Win $5000! – In Parker’s amazing writing discovery sweepstakes.” Medium, alloy nib. New-old-stock. Mint. Converter included. 1970 Parker 45 Coronet cartridge/converter-fill in Metallic Grey. 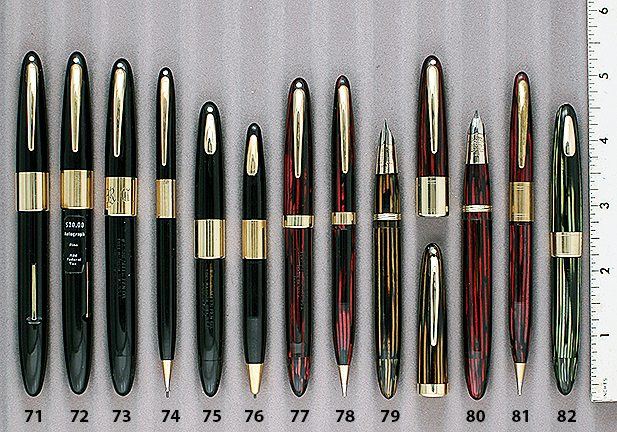 Parker developed a process to adhere a satin finish to an aluminum pen body. These are rare today. This one in Grey, with a GP barrel end. Medium GF clip. alloy nib. New-old-stock. Mint. Converter included. 1970 Parker 45 Coronet cartridge/converter-fill in Metallic Grey. 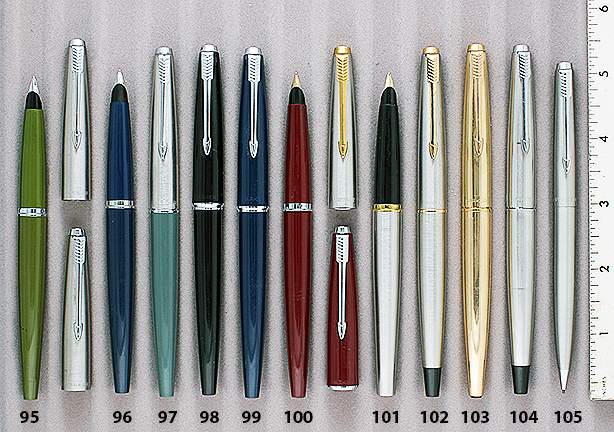 Parker developed a process to adhere a satin finish to an aluminum pen body. These are rare today. This one in Green, with a black barrel end. 14K medium/fine nib. GF clip. alloy nib. New-old-stock. Mint. Converter included. 1970 Parker 45 Coronet cartridge/converter-fill in Metallic Grey. 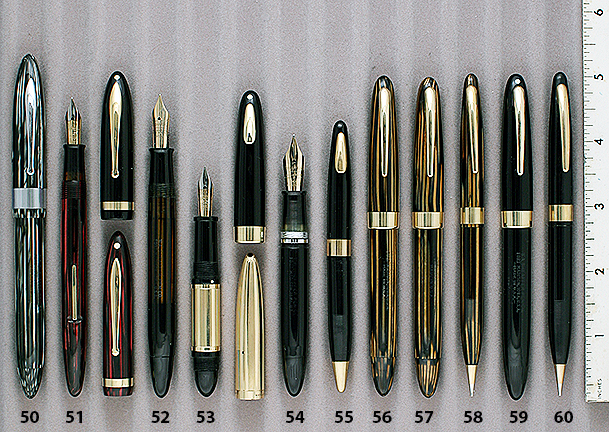 Parker developed a process to adhere a satin finish to an aluminum pen body. These are rare today. This one in Grey, with a black barrel end. GF clip. Medium, alloy nib. New-old-stock. Mint. Converter included. 1975 Parker 45 Harlequin acid etched “Grey Shield” cartridge/converter-fill in stainless steel. Production was very difficult and the Harlequin was short lived, and very rare today. Alloy nib. New-old-stock. Mint. Converter included. Two available: (1) Medium/fine nib; (2) Medium “ball” nib. 1975 Parker 45 Harlequin acid etched “Grey Circlet” cap activated ball pen in stainless steel. Production was very difficult and the Harlequin was short lived, and very rare today. New-old-stock. Mint. Kaspas Faber started making pencils in the mid-1600s. Successive generations increased the size and scope of operations and the Company grew and thrived. During the US Civil War they set up a pencil factory in Brooklyn, NY. 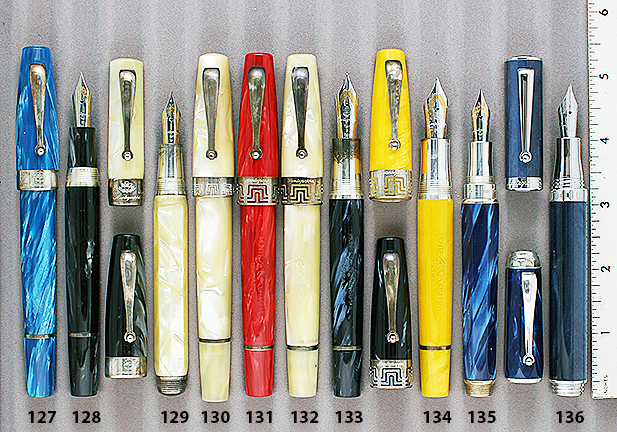 They entered the fountain pen business in 1935, with the acquisition of the Osmia fountain pen company. 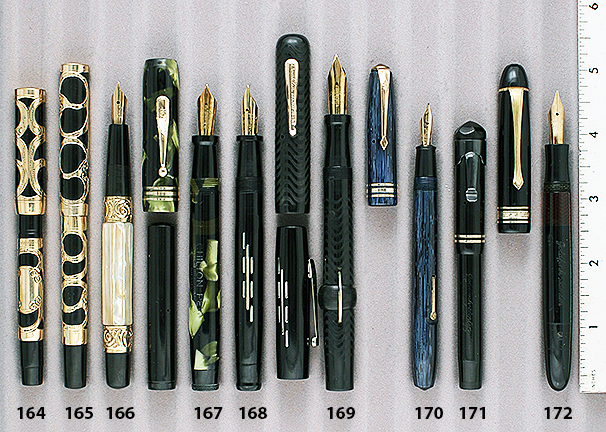 2000 Faber-Castell Classic Collection cartridge/converter-fill in ribbed Ebony Wood with Rhodium Plate cap. Spring Clip. Two-toned 18K extra-fine nib. New-old-stock. Mint. Converter included. 2000 Faber-Castell Classic Collection Rollerball in ribbed Pernambuco Wood with Rhodium Plate cap. Spring Clip. New-old-stock. Mint. 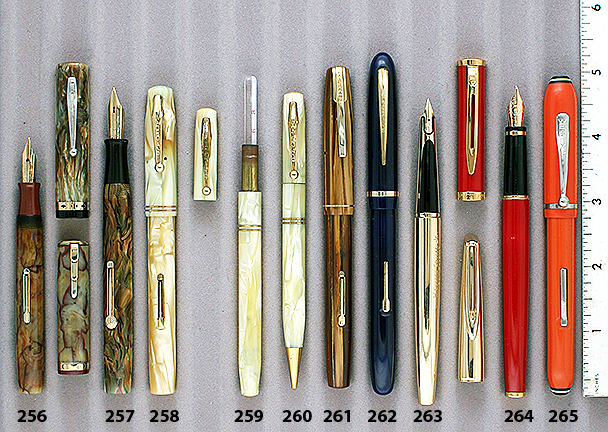 2000 Faber-Castell Classic Collection cartridge/converter-fill in ribbed Pernambuco Wood with Sterling Silver cap. Spring Clip. Two-toned 18K fine nib. New-old-stock. Mint. Converter included. Will polish on request. 2000 Faber-Castell Classic Collection cartridge/converter-fill in Black Guilloche Rhodium Plate cap. Spring Clip. 18K extra-fine nib. New-old-stock. Mint. Converter included. 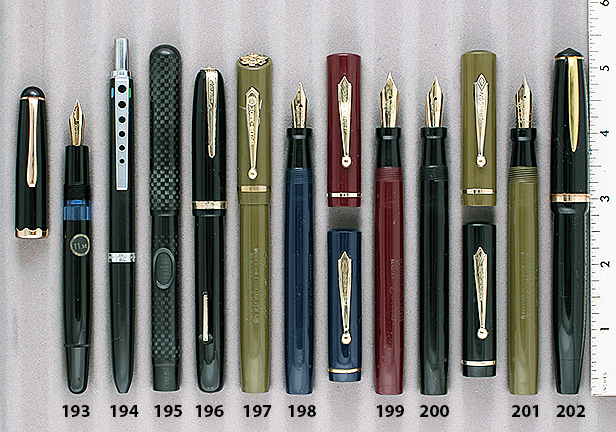 2005 Faber-Castell Classic Collection cartridge/converter-fill in ribbed Grenadilla Wood with Sterling Silver cap. Spring Clip. Two-toned 18K fine nib. New-old-stock. Mint. Converter included. Will polish on request. 2005 Faber-Castell Mondo Collection Ball Pen in Soft Finish Black. Chrome plated trim. Spring clip. Near mint. [Two available]. 2013 Faber-Castell Ambition Collection Ball Pen in Coconut wood. Chrome plated trim. Spring clip. Near mint. 2013 Faber-Castell Classic Collection Guilloche cartridge/converter-fill in Rhodium plated. “Barley” pattern. Spring clip. 18K extra-fine nib. New-old-stock. Mint. 1999 Montegrappa Classica cartridge/converter-fill in Turquoise. Sterling Silver Trim and barrel threads.. Two-toned extra-fine nib. New-old-stock. Mint. Converter included. Will polish on request. 1999 Montegrappa Classica cartridge/converter-fill in Charcoal Pearl. Sterling Silver Trim and barrel threads. Two-toned extra-fine nib. New-old-stock. Mint. Converter included. 1999 Montegrappa Symphony octagonal-faceted cartridge/converter-fill in White Pearl. Sterling Silver trim, barrel threads and gripping section. Two-toned extra-fine nib. The cap screws onto the bottom of the pen for posting. New-old-stock. Mint. Converter included. Will polish on request. 1999 Montegrappa Historia LE 0466/1000 cartridge/converter-fill in Parchment. Sterling Silver trim and gripping section. Cap band with Greek-Key fretwork. Two-toned 18K medium nib. New-old-stock. Mint. Converter included. Will polish on request. [Two available; the second LE 0629]. 2003 Montegrappa Extra Collection piston-fill in Red Pearl. Sterling Silver trim and gripping section. Cap band with Greek-Key fretwork. Two-toned 18K fine nib. New-old-stock. Mint. Will polish on request. 2003 Montegrappa Extra Collection piston-fill in Parchment. Sterling Silver trim and gripping section. Cap band with Greek-Key fretwork. Two-toned 18K medium nib. New-old-stock. Mint. Will polish on request. 2003 Montegrappa Extra Collection piston-fill in Blue Pearl. Sterling Silver trim and gripping section. Cap band with Greek-Key fretwork. Two-toned 18K nib. New-old-stock. Mint. Will polish on request. Two available: (1) Fine nib; (2) Medium nib. 2003 Montegrappa Extra Collection piston-fill in Yellow Pearl. Sterling Silver trim and gripping section. Cap band with Greek-Key fretwork. Two-toned 18K medium nib. New-old-stock. Mint. Will polish on request. 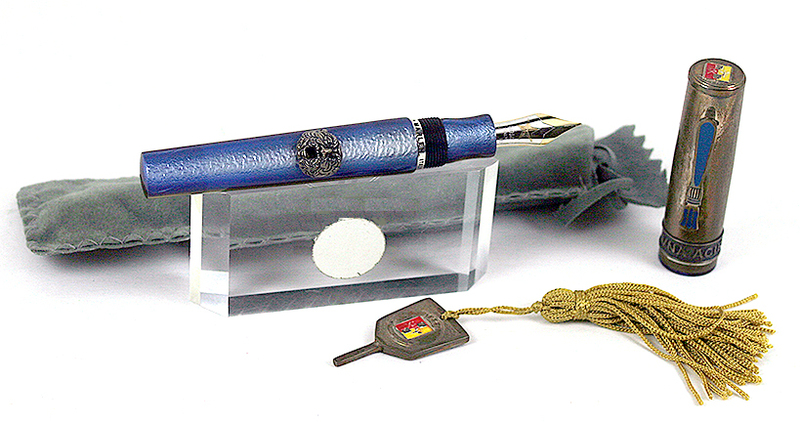 2012 Montegrappa Emblema cartridge/converter-fill in Blue Pearl. Sterling silver trim, barrel threads and gripping section. Two-toned 18K extra-fine nib. The cap screws onto the bottom of the pen for posting. New-old-stock. Mint. Converter included. 2012 Montegrappa Expressione cartridge/converter-fill in Blue Pearl. Sterling silver trim, barrel threads and gripping section. 18K extra-fine nib. The cap screws onto the bottom of the pen for posting. New-old-stock. Mint. Converter included. 1986 Visconti Monte Carlo cartridge/converter-fill in Black. GPT. Gold-plate, medium nib. New-old-stock. Mint. Converter included. 1986 Visconti Monte Carlo Rollerball in Brown. GPT. New-old-stock. Mint. 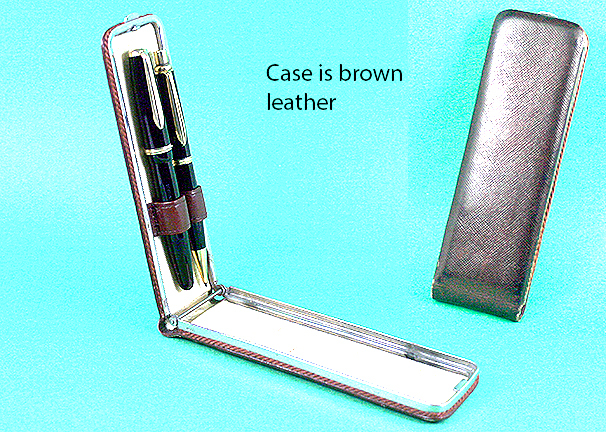 Buy with matching fountain pen above at $75. 1995 Visconti Voyager Oversize Plunger-fill in Lapis with Sterling Silver overlay in “Night & Day” pattern. 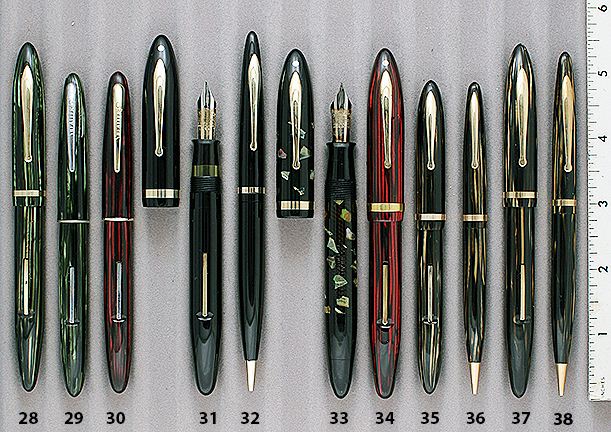 Exclusive to Fountain Pen Hospital, commemorating their 50th Anniversary (1946 – 1996). Sterling Silver trim. I could not find an LE number on the pen. It must be a very limited production special edition, as I have never seen another and there is no information at all about it on the Internet. If you know something about this pen, please let me know. Two-toned 18K nib (fine). New-old-stock. Mint. Will polish on request. 1995 Visconti Mazzi Landscape of Soul New York LE #036/206 Rollerball in New York themed air brushed art cap and barrel. Platinum plated trim. New-old-stock. Mint. 1999 Visconti Acrylic Convention Pen in Blue Pearl Marble with Bronze Veins. Cap band engraved “Third Visconti Convention 15-01-2002.” Platinum plated trim and gripping section. 18K broad nib. New-old-stock. Mint. Converter included. 1999 Visconti Acrylic Night & Day cartridge/converter-fill in Blue Pearl with White Specks. Sterling silver trim with Platinum plated overlay and gripping section. 14K medium nib. New-old-stock. Mint. Converter included. Will polish on request. 1999 Visconti Acrylic Night & Day cartridge/converter-fill in Bronze Pearl with White Veins. Sterling silver trim with Platinum plated overlay and gripping section. 14K broad nib. New-old-stock. Mint. Converter included. Will polish on request. 2000 Visconti Acrylic cartridge/converter-fill in Green with White Ribbon. CPT. Platinum plated gripping section. Platinum plated fine nib. New-old-stock. Mint. Converter included. 2000 Visconti Acrylic cartridge/converter-fill in Translucent yellow with Brown & White Ribbon. CPT. Platinum plated gripping section. Platinum plated fine nib. New-old-stock. Mint. Converter included. 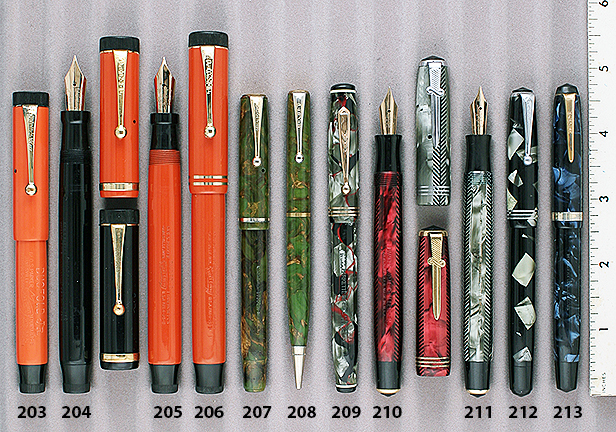 2000 Visconti Acrylic cartridge/converter-fill in Bronze Pearl with White Veins. CPT. Platinum plated gripping section. Platinum plated fine nib. New-old-stock. Mint. Converter included. 2000 Visconti Acrylic cartridge/converter-fill in Black. CPT. Platinum plated gripping section. Platinum plated fine nib. New-old-stock. Mint. Converter included. 2000 Visconti Voyager Demonstrator LE 131/188 Plunger-fill in Clear with Black Swirl. Sterling silver trim. Rare model, with three cap bands. Two-toned, 18K extra-fine nib. New-old-stock. Mint. 2000 Visconti Sassuolo Lux LE 312/1000 cartridge-converter-fill in Black. Only 599 produced (+400 produced in Orange). White outline of the Ducal Palace in Sassuolo on black Lucite barrel. Engine-turned Rhodium plate cap bands. Two-toned 18K nib (extra-fine). New-old-stock. Mint. Converter included. 2003 Visconti Wall Street Prototype faceted Plunger-fill in Silver Laminated. Prototype salesman’s sample of soon to be issued LE in 2004, with unmarked cap band. Patented “Power-fill” system. Two-toned 18K nib (medium-fine). New-old-stock. Mint and rare. 2003 Visconti Wall Street Prototype faceted Plunger-fill in Green Laminated. Prototype salesman’s sample of soon to be issued LE in 2004, with unmarked cap band. Patented “Power-fill” system. Two-toned 18K nib (extra-fine). New-old-stock. Mint and rare. 2004 Visconti Kaleido cartridge/converter-fill in Honey Almond. GPT with open filigree cap band. Two-toned 18K medium nib. New-old-stock. Mint. Converter included. 2004 Visconti Wall Street Opera faceted cartridge/converter -fill in Black with chased vertical pinstriping on all the wider panels. CP trim. Two-toned 14K nib (fine). New-old-stock. Mint. Converter included. 1995 Pelikan M800 PIF in Green Striped with Black cap. GPT. Visualated barrel. Two-toned 18C, medium nib. New-old-stock. Mint. 2004 Pelikan M400 Souveran PIF in Black. GPT. Visualated barrel. Two-toned 18C nib, marked “F,” but appears more medium/fine to me. New-old-stock. Mint. 2005 Omas Paragon PIF in Palm Wood (from India). CPT. 18K EF nib. New-old-stock. Mint with leather pouch. 2005 Omas Paragon Precious Ebony Wood (from Madagascar) Octagonal PIF with sterling silver upper barrel and gripping section. CPT. 18K EF nib. New-old-stock. Mint with leather pouch. 2005 Omas Paragon Snake Wood Octagonal PIF with sterling silver upper barrel and gripping section. CPT. 18K EF nib. New-old-stock. Mint with leather pouch. 2006 Omas Bologna Resin Cotton Resin cartridge/converter-fill in Black. 14K fine nib. New-old-stock. Mint with leather pouch. Converter included. 2009 Stipula Etruria Nuda LE #131/351 piston-fill demonstrator in clear acrylic. Sterling silver trim. 14K fine nib. New-old-stock. Mint. 2010 Montblanc 144 Solitaire Silver Fibre Guilloche cartridge/converter-fill in highly polished Sterling Silver with Anthracite Lacquered Guilloche Stripes and Platinum plated clip. Medium/fine, italic nib. New-old-stock. Mint. 2013 Montegrappa Cartridge/converter-fill in Carbon Fibre black. Sterling silver trim, barrel threads and gripping section. I believe this is the first pen Montegrappa produced under license from the Ayrton Senna Foundation.18K medium nib. Near mint. Converter included. 1912 A.A. Waterman#3 Twist-fill in Gold-filled “Filigree” overlay on BHR. The filigree is reminiscent of the “Parker 16″ and may also have been done by Heath of New York. Medium, flexible nib. New-old-stock. Mint. 1900 Aikin Lambert #2 eyedropper-fill in Gold-filled “Filigree” on Black Hard Rubber. Indicia engraved “GWM.” Fine, triple-flexible nib. Near mint. 1910 Anonymous #4 size eyedropper-fill in Black Hard Rubber with Grooved Pearl Slabs and wide GF repousse barrel bands. 14K medium nib. Near mint and beautiful! 1931 Chilton #6 Pneumatic-fill in Green Marble. GFT. Large pen with medium/fine nib. To fill, using the knob at the bottom of the pen, the user pulls to expose a metal sleeve. The sleeve is then repelled into place while holding your finger over the air hole in the knob. Releasing the finger than allows the bladder to expand and draw up the ink. Very reliable and innovative, and allowed use of a very large bladder. Near mint+ (could be new-old-stock). 1936 Chilton Wingflow pneumatic-fill in Black with inlaid 14K White Gold (used to avoid tarnishing) geometric design. Also sports Chilton’s patented spring-loaded “rocker clip.” See pen above for a description of the filling mechanism. Medium/broad nib. A little wear to the turning knob, otherwise near mint. 1918 Conklin 50 Crescent-fill in Black Chased Hard Rubber. Large and beautiful pen! GFT. Fine nib with a tad of flex. Near mint. 1951 Conway Stewart 36 LF in Blue with Black Pinstriping. GFT. Medium nib. Some trim wear, but quite respectable. Excellent. 1935 Goldfink Model D1 BF in Black Hard Rubber. Rare model! GFT with Black Metal accommodation clip. 6-sided inner cap with knurled border. Outstanding fine, triple-flexible nib. Near mint. 1955 Goldfink Standard #4 size Piston-fill in Black. GFT, with “Greek Key” design middle cap band. Visualated barrel window with geometric design. Inner cap topped with the Goldfink 6-sided design. Medium/broad oblique nib (shaped like left foot) with a tad of flex. Near mint. 2007 Harrods Rollerball – Ball Pen Set in Dark Grey. Chrome-plate trim. Sold at their Knightsbridge, London store. A wonderful user, and souvenir of this world famous store. New-old-stock. Mint. 2007 Harrods twist-activated ball Pen for above set. 1938 Kaweco Elite 190 PIF in Black Chased Celluloid. GPT. Visualated barrel. Medium nib. New-old-stock. Mint in original box with tissue sleeve, instructions and original cap label. Close-up of pen in box. 1910 Mabie Todd Propelling Safety Pen eyedropper-fill in Red Mottled Hard Rubber. Extremely rare, especially in Mottled HR. Fine nib. New-old-stock. Mint in original box with original instructions, dated 1910. Close-up of pen in box. 1912 Mabie Todd Swan 1 “S-F” (Self-Filler) LF in Red Mottled Hard Rubber. Comes with the rare Mabie Todd “Pocket Pal” (imprinted with the Swan logo on the front and “Swan Metal Pocket” on the back) combination pocket protector/accommodation clip. Fine, extra-flexible nib. Pen is new-old-stock. Pocket Pal has some wear. 1915 Mabie Todd Swan Trench Pen (#2 size) eyedropper-fill in Black Chased Hard Rubber. A hidden compartment in the bottom of the pen, accessed by turning the blind cap, holds ink pellets. Pellets are dropped into the barrel and water added – instant ink, and no bottle to carry around while fighting in the WW I trenches! Medium/fine nib. Near mint. 1925 Mabie Todd Swan 44 Eternal in Black Hard Rubber. GFT with Wide horizontally chased bands at the cap top and lip. Fine nib. Some imprint wear (third line hardly readable), otherwise near mint. 1937 Mabie Todd 4-size Swan Eternal “Leverless” twist-fill in Green Pearl with Black ends (beautiful!). GFT. Medium/broad nib. Some scratches on the turning knob, otherwise new-old-stock. Mint. 1937 Mabie Todd L445/60 Swan “Leverless” twist-fill in Green Pearl. GFT. A tad of clip ball and cap band lower edge brassing, otherwise near mint. Broad, italic nib. Barrel imprint has been highlighted with gold. 1947 Mabie Todd Swan 1 LF in Dark Green. NPT. A plain looking pen – but with an outstanding medium, triple-flexible nib! A little wear to cap bands, otherwise near mint. 1935 Montblanc 324 BF in Black (rare model – much rarer than the piston-fill Model 334). GFT. “ASCO” logo on cap. Broad, extra-flexible, italic nib. Near mint. 1937 Montblanc 334 ½ PIF in Black. GFT. Visualated barrel. Near mint. 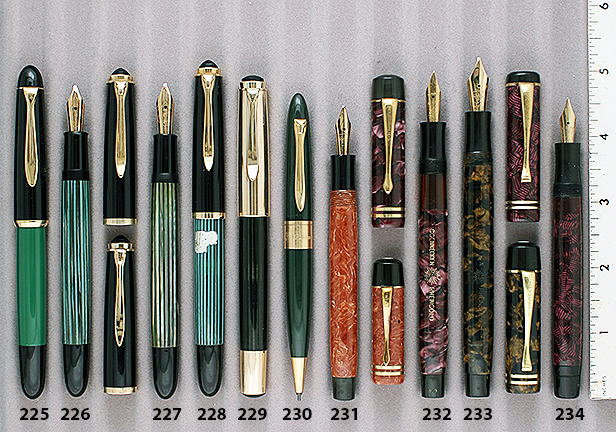 Two available: (1) Fine, flexible nib; (1) Fine extra-flexible nib. 1940 Montblanc 136 Meisterstuck PIF in Black. GFT. 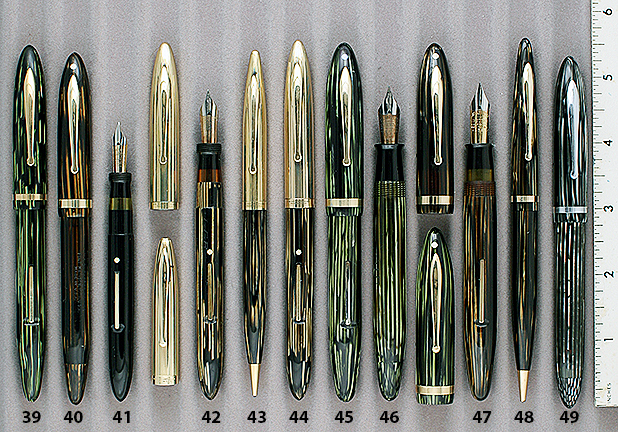 Wartime, alloy (gold, iridium, palladium), double-broad, oblique nib. 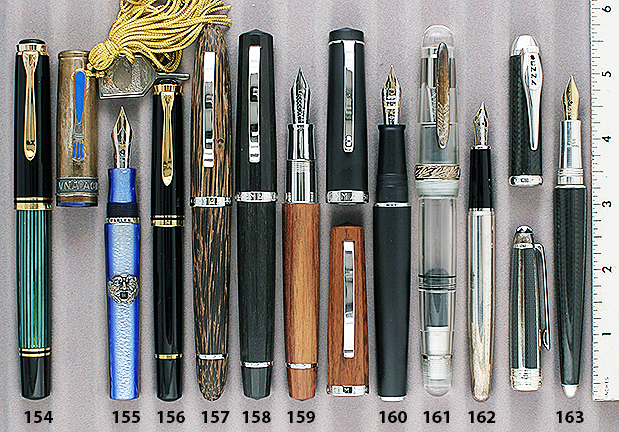 Many folks believe these write even better than Montblanc’s solid gold nibs! Long visualated barrel window (no vertical lines). Tiniest bit of wear to the nib, otherwise near mint. 1946 Montblanc 246 BF in Green with Black Veins (rare and beautiful!). GFT. The largest size in which this model was produced. Visualated barrel. Fine, flexible nib. Near mint. 1946 Montblanc 246 BF in Black. GFT. The largest size in which this model was produced. Visualated barrel. Medium nib, with a tad of flex. Near mint. 1946 Montblanc 244 PIF in Tiger’s Eye (one of Montblanc’s most beautiful Celluloids). GFT. Medium nib with a tad of flex. Near mint. 1947 Montblanc 134 Meisterstuck PIF in Black. Rare transitional model with three cap bands, the center band inscribed “Montblanc Meisterstuck.” Visualated barrel with perfect vertical lines. Two-toned, medium, flexible nib. Correct transitional clip. New-old-stock. Mint. 1950 Montblanc 644 Masterpiece PIF in Green Striped with Rolled-gold (gold-filled) cap (alternating pinstriped and plain panels). Two-toned, medium nib. A few minor surface scratches on the cap from being around for 75 years (no dents or dings), otherwise near mint. 1955 Montblanc 142 Masterpiece PIF in Green Striped (very rare). GFT. Visualated barrel. Two-tone, medium, flexible, italic nib. New-old-stock. Mint. 1946 Montblanc Carrera cartridge/converter-fill in Yellow with Black metal cap. Chrome clip. Broad nib (steel). New-old-stock. Mint with original label. Converter included. 1975 Montblanc Carrera 4-Color Ball Pen in Black. Red-Green-Blue-Black. Chrome trim. New-old-stock. Mint. 1912 Moore 3.00/75 Safety eyedropper-fill in Black “Checkerboard” Chased Hard Rubber. Two very rare features on this pen. First, the holes in the barrel slide, allowing the user to actually hold the barrel while turning the cap onto and off of the pen (so the turning barrel doesn’t interfere), and the “checkerboard” chasing, rather than the much more common “wave” chasing. Extra-fine, extra-flexible nib. Near mint. 1940 Moore 2 LF in Black. GFT. I have to call this “user grade” because under a loop I can see some flaking off of the gold fill. However, this is more than made up for with the wonderful Medium, extra-flexible, italic nib (my favorite nib!). 1944 Morrison Patriot Army plunger-fill in Khaki. GP trim, including the Army Insignia mounted on the slanted top of the cap. GP signed Morrison fine-extra-fine nib Near mint. 1944 Morrison Patriot plunger-fill in Midnight Blue. GFT. 14K. medium nib, with tad of flex. Near mint. 1944 Morrison Patriot plunger-fill in Burgundy. GFT. 14K. fine nib. Near mint. 1944 Morrison Patriot plunger-fill in Black. GFT. 14K. medium/fine nib. Near mint. 1944 Morrison Patriot plunger-fill in Khaki. GFT. GP fine, extra-flexible nib. Near mint. 1943 Olsen Penol Standard BF in Black. GFT. Oversize pen, with broad 14K “Penol Ambassador” nib (a superior replacement for the original 14K “Penol De Luxe” nib). Near mint+. 1922 Parker Duofold Jr. BF in Red Hard Rubber. Very rare, first year bandless model. 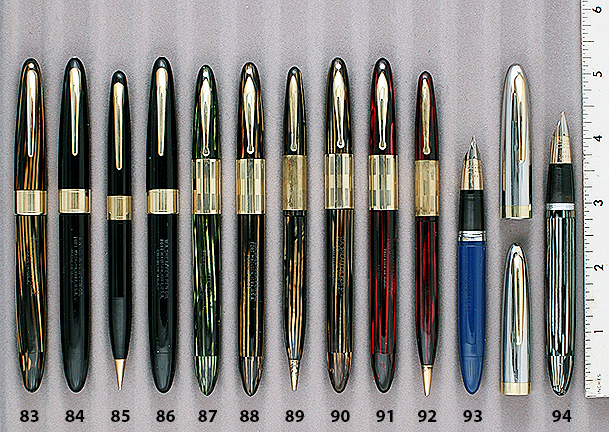 Very shortly after introduction Parker added the cap band (which they called the “golden girdle”) in order to stop the widespread cap lip breakage caused by the stresses of posting the cap onto the barrel. GF clip. Fine nib. Fully restored and no signs of ink or usage. However, there are a number of surface scratches noticeable under magnification. 1926 Parker Duofold Sr. BF “Big Red” in Cardinal. GFT. Medium nib. Near mint. 1927 Parker Duofold Sr. BF “Big Red” in Cardinal. GFT. Extraordinarily broad/double-broad nib! Near mint. 1932 Parker Thrift Time BF Set in Green & Bronze. GFT. Medium/broad nib with a tad of flex. A little trim brassing, otherwise near mint. 1932 Parker Thrift Time twist-activated pencil for above set. 1935 Parker Parkette Deluxe Faceted LF in Silver Pearl with Red Veins. Set off nicely with white bands at the black ends. GFT. Two-toned, fine nib. Mint imprint. A touch of wear here and there, noticeable with a loop. 1937 Parker Deluxe Challenger Jr. BF in Grey Pearl Marble. NPT. Fine nib. Near mint. 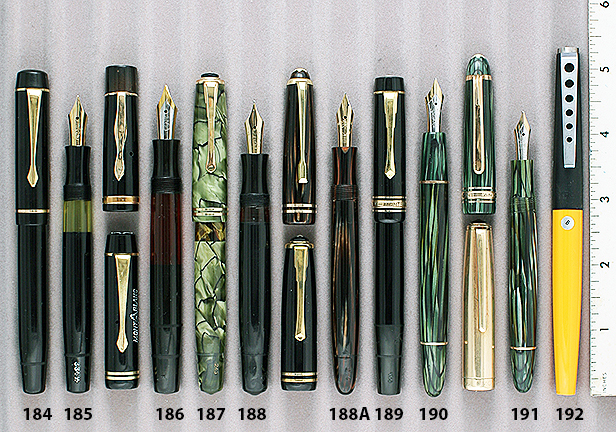 1941 Parker Duofold Jr. BF in Green, Bronze and Black Vertical Striped. GFT. Visualated section. Fine, flexible nib. Near mint. 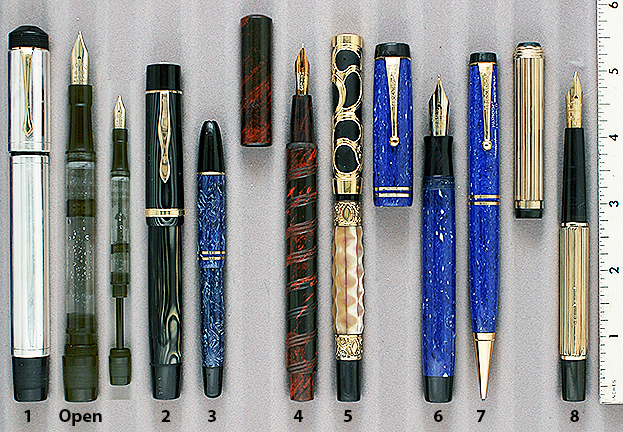 1941 Parker Duofold BF in Blue, Silver and Black Vertical Stripe. GFT. Visualated section. Fine nib, with a tad of flex. Near mint. 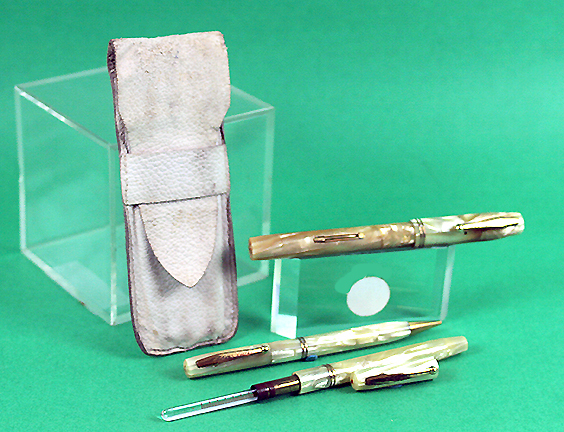 1958 Parker Jotter Prototype “Doctor’s Set” in White with Brushed Lustraloy (stainless steel) caps and Arrow Clips, which were introduced in 1958. Obtained from the Parker employee charged with developing the Jotter thermometer case. Thermometer holder. New-old-stock. Mint. 1958 Parker Jotter button-activated Ball Pen for above set. 1958 Parker Jotter twist-activated pencil for above set. 1950 Pelikan 400 PIF in Brown Striped. GFT. Visualated barrel. User grade pen, only because of some brassing of the cap band and clip (otherwise near mint. Fine nib. See matching pencil – item #223 below. 1950 Pelikan 400 PIF in Brown Striped. GFT. Visualated barrel. Medium/broad, oblique nib (shaped like left foot). Visualated barrel. Near mint+. See matching pencil – item #223 below. 1956 Pelikan 400NN in Brown Striped. GFT. Visualated barrel. “Click Cap” designed so the cap locks and won’t open in the user’s pocket. Near mint+. Two available: (1) Fine nib, with a tad of flex; (1) Medium nib. See matching pencil – item #223 below. 1956 Pelikan 455 Button-activated Ball Pen in Brown Striped. GFT. Near mint+. Matches all the Brown Striped pens above. 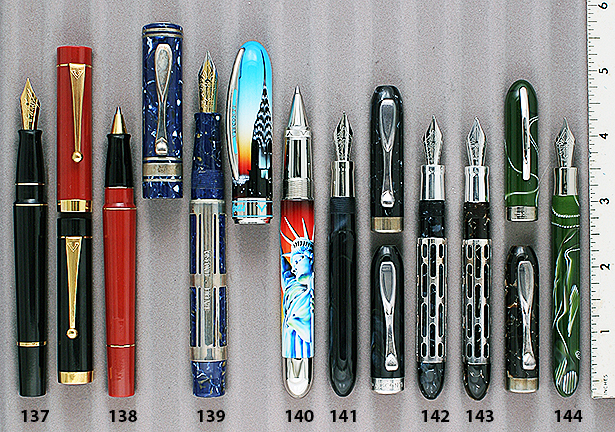 Buy with any one of the pens at $75. 1954 Pelikan 140 PIF in Green Striped with Black cap. GFT. Visualated barrel. Medium/fine nib, with a tad of flex. Near mint. 1955 Pelikan 120 PIF in Green with Black cap. GPT. Visualated barrel. Gold-plate, medium/fine nib. New-old-stock. Mint. 1956 Pelikan 400NN PIF in Green Striped. GFT. Visualated barrel. Near mint. Two available: (1) Medium/broad, oblique nib (shaped like left foot); (1) DF nib (fine, manifold). 1956 Pelikan 400NN PIF in Grey Striped (very rare color). GFT. Visualated barrel. Near mint. Double-broad, oblique nib (shaped like left foot). 1956 Pelikan 400NN PIF in Green Striped. GFT. Visualated barrel. “Click Cap” designed so the cap locks and won’t open in the user’s pocket. Broad, oblique nib (shaped like left foot). New-old-stock. Mint with original label. (part of label missing & unreadable). 1956 Pelikan 500 PIF in Black with Green striped visualated barrel. Gold-filled cap in alternating pinstriped and plain panels. Near mint. Two available: (1) “KM”, flexible nib [Kugel (Ball) medium]; (1) Broad, with a tad of flex. 1933 Soennecken Rheingold 911 BF in Burnt Orange Pearl. A top-of-the-line model, in a rare size and very rare color! GFT. “Starburst S” logo in cap top. Stub, italic nib! Near mint+ (likely new-old-stock)..
1933 Soennecken Rheingold 1913 BF in Red Pearl with Black Veins. A top-of-the-line model. GFT. “Starburst S” logo in cap top. Visualated barrel. Extra-fine, triple-flexible nib! Near mint. 1933 Soennecken Rheingold 917 BF in Black & Bronze. A top-of-the-line model. Large, rare and beautiful pen! GFT. “Starburst S” logo in cap top. Double-broad, flexible nib! Near mint. 1938 Soennecken 507 piston-fill in Red Pearl Web. GFT. Visualated barrel. Fine, flexible nib. Near mint. 1938 Soennecken 507 piston-fill in Green Pearl. GFT. Visualated barrel. Fine, flexible nib. Eagle logo in cap top and barrel imprint each have a little wear but are fully legible, otherwise near mint. 1946 Soennecken 120 piston-fill in Ivory Pearl with Black Veins (quite beautiful). GFT. Visualated barrel. Fine, alloy nib. New-old-stock. Mint. 1952 Soennecken 103 PIF in Silver Pearl with Black pinstriping. GFT. Visualated barrel. Medium nib with a tad of flex. Near mint. 1940 Venus #3 size LF in Dark Grey with Grey Pearl Pinstriped cap. GFT. 14K medium/fine nib with a tad of flex. A little imprint wear and some minor surface scratches. Excellent. 1905 Waterman 12 ½ eyedropper-fill in Black Chased Hard Rubber. The barrel with two gold-filled repousse bands. Fine, extra-flexible nib. Looks to be new-old-stock. A wonderful collectible pen! 1908 Waterman 412 eyedropper-fill in Sterling Silver “Filigree” on black hard rubber. Slight oxidation of the hard rubber. Lots of age patina (will polish on request). Near mint. 1915 Waterman 0552 ½ LEC (Long Extended Case) in Gold-filled “Basket-Weave” on BHR. Fine, extra-flexible, italic nib. A few very minor scratches to the cap top, otherwise near mint. 1920 Waterman 56 LF in Woodgrain Hard Rubber. Rarer then the Red Ripple. GFT. Fine nib. Outstanding color and condition, like it came out of the factory yesterday! 1920 Waterman 52 1/2V LF in Black Chased Hard Rubber. Very rare size to find with a clip rather than a ring-top. NPT. Fine, italic nib. Perfect for your journal, diary or quick notes. Barrel imprints have been highlighted in white – I’ll remove this on request. Near mint. 1920 Waterman 42 Continental Octagonal Safety eyedropper-fill in 18K gold-filled. Alternating panels of raised yellow GF filigree and white GF chevrons formed within pinstriping. Matching cap, Smooth crown and clip. Fine, flexible nib. A few minor dings in the cap top, otherwise near mint. 1924 Waterman 452 ½ LF in Sterling Silver “Basket-Weave” on BHR. Indicia engraved in Old English: “EN.” Under a loop there are plenty of noticeable small surface scratches, so I’ll call this “User Grade.” But another with my favorite nib: fine, extra-flexible. You’ll love it! 1924 Waterman 452 ½ LF in Sterling Silver on BHR. “Gothic” pattern. Fine, extra-flexible nib. Under a loop there are plenty of noticeable small surface scratches, so I’ll call this “User Grade.” But it has my favorite nib: fine, extra-flexible! A joy to write with. 1925 Waterman 52 twist-activated pencil for above set. 1925 Waterman 56V LF in Red Ripple. Very rare size! GFT. Medium, flexible, italic nib. Another in outstanding color and condition, like it came out of the factory yesterday! 1926 Waterman 5 LF in Red Ripple. Has the “Purple” band near the cap top and “Purple” stamped nib. Waterman color-coded their nibs; Purple stood for fine, stiff. GFT. Wonderful condition. Could be new-old-stock. 1936 Waterman #94 LF in Persian (rare color). GFT. 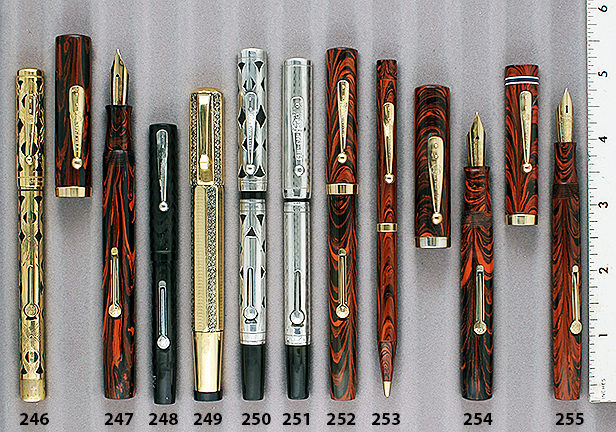 Waterman’s only #94 with the die-cut, filigree cap band. Signed Waterman “Red” nib (Waterman’s color code for a medium, flexible nib). A little darkening, but very nice color, otherwise near mint. 1935 Waterman 2 Nurse’s LF Set: Fountain Pen – Thermometer – Pencil. GFT. Fine nib. A tad of ambering to the fountain pen. New-old-stock. Mint in original leather carrying pouch. The pouch is soiled and has taken on the shape of the pens, but has no tears or other physical damage. And it functioned to keep the contents in remarkable condition for all these years. Close-up of pen in pouch. 1935 Waterman Thermometer Holder for above set. 1935 Waterman twist-activated pencil for above set. 1955 Waterman Champion 501 LF in Dark Blue. UK Manufacture. GFT. 14K medium, extra-flexible nib. A few minor surface scratches here and there. Respectable quality from close to the end of the USA Waterman Company. 1971 Waterman CF cartridge-converted-fill in 14K Solid Gold. Very rare! Inlaid gold-filled gripping section. Comes with the very rare converter (originally, the “CF” pen – which stands for “Cartridge-Fill” did not come with a converter and there are far, far more pens around than converters). Extra-fine nib. Barrel engraved “W. Cordys Snyder, Jr. Sewickley, PA.” New-old-stock. Mint. 2001 Waterman Preface cartridge/converter-fill in Red Lacque. GPT. 18K medium nib. New-old-stock. Mint. Converter included. 1929 Waterman 2 LF in Cardinal Streamlined. Set off nicely with black-white-black ends. I don’t usually list Wearever pens, but this one was too nice to pass up, and even sports a 14K nib (medium)! NPT. Near mint.